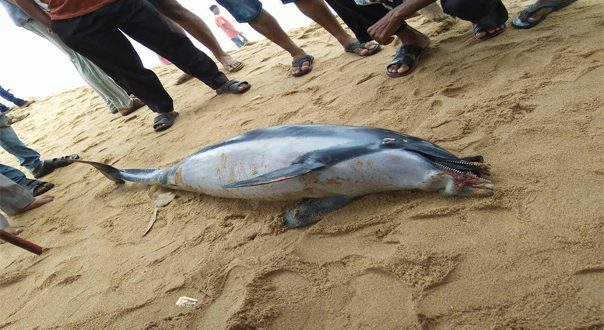 Balasore: A rare species of fresh-water dolphin was found dead in the Budhabalanga river in Balasore, said a forest official on Sunday. The carcass of the dolphin was found at Dalagaharia ghat under Remuna block. Dalagharia ghat is the confluence of rivers Budhabalanga, Soa, and Gangahar. Some locals had seen the dolphin near the ghat area in the wee hours of Saturday and informed the forest department. Forest officials reached the spot. “It was a Gangetic dolphin, a rare species,” said DFO Harshbardhan Udgata. The DFO rushed to the spot and recovered its carcass and sent it to Nilagiri for post-mortem. As for its death, DFO Udgata suspected the mammal might have been wounded by fishermen’s nets or by trawlers. “As Its jaw bone has broken, it was unable to eat. The cause of its death will be known after receiving the post-mortem report,” he added. Locals demanded conservation of the dolphin species as several dolphins were found dead at this spot in previous years.